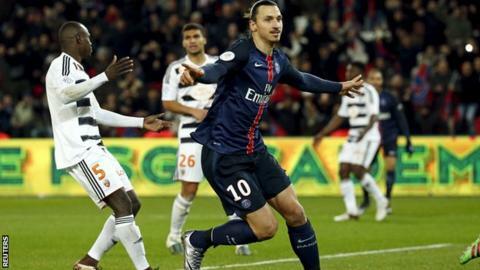 Paris St-Germain set a new Ligue 1 record as they extended their unbeaten run to 33 matches with victory over Lorient. Edinson Cavani rounded the goalkeeper early on to open the scoring but Raphael Guerreiro drove in the equaliser for the visitors. Zlatan Ibrahimovic restored PSG's lead with a tap in before Layvin Kurzawa volleyed home a third. The win means PSG remain 24 points clear at the top of the table. Match ends, Paris Saint Germain 3, Lorient 1. Second Half ends, Paris Saint Germain 3, Lorient 1. Corner, Lorient. Conceded by Blaise Matuidi. Corner, Lorient. Conceded by Benjamin Stambouli. Attempt missed. Blaise Matuidi (Paris Saint Germain) left footed shot from the left side of the six yard box is close, but misses to the left. Assisted by Layvin Kurzawa. Attempt blocked. Ángel Di María (Paris Saint Germain) left footed shot from outside the box is blocked. Assisted by Lucas Moura. Attempt blocked. Lucas Moura (Paris Saint Germain) right footed shot from outside the box is blocked. Assisted by Ángel Di María. Attempt missed. Benjamin Stambouli (Paris Saint Germain) left footed shot from outside the box is high and wide to the left. Assisted by Lucas Moura. Corner, Lorient. Conceded by Layvin Kurzawa. Corner, Lorient. Conceded by Marquinhos. Attempt blocked. Majeed Waris (Lorient) header from the left side of the six yard box is blocked. Attempt saved. Walid Mesloub (Lorient) right footed shot from outside the box is saved in the centre of the goal. Attempt saved. Ángel Di María (Paris Saint Germain) left footed shot from the centre of the box is saved in the centre of the goal. Assisted by Lucas Moura with a through ball. Offside, Paris Saint Germain. Benjamin Stambouli tries a through ball, but Edinson Cavani is caught offside. Attempt missed. Raphael Guerreiro (Lorient) left footed shot from the left side of the box is high and wide to the left. Assisted by Jimmy Cabot. Attempt blocked. Jimmy Cabot (Lorient) left footed shot from the left side of the box is blocked. Assisted by Walid Mesloub. Majeed Waris (Lorient) wins a free kick on the right wing. Corner, Lorient. Conceded by Lucas Moura. Attempt blocked. Didier Ndong (Lorient) right footed shot from outside the box is blocked. Assisted by Walid Mesloub. Substitution, Lorient. Yann Jouffre replaces Rafidine Abdullah. Attempt saved. Zargo Toure (Lorient) header from the centre of the box is saved in the top centre of the goal. Assisted by Walid Mesloub with a cross. Corner, Lorient. Conceded by Serge Aurier. Attempt missed. Ángel Di María (Paris Saint Germain) left footed shot from outside the box is close, but misses to the right. Assisted by Lucas Moura. Attempt saved. Walid Mesloub (Lorient) right footed shot from outside the box is saved in the centre of the goal. Assisted by Rafidine Abdullah. Substitution, Paris Saint Germain. Lucas Moura replaces Zlatan Ibrahimovic. Substitution, Paris Saint Germain. Ángel Di María replaces Jean-Kevin Augustin. Goal! Paris Saint Germain 3, Lorient 1. Layvin Kurzawa (Paris Saint Germain) left footed shot from the left side of the box to the bottom right corner. Offside, Lorient. Walid Mesloub tries a through ball, but Jimmy Cabot is caught offside. Substitution, Lorient. Jimmy Cabot replaces Maxime Barthelme. Substitution, Lorient. Benjamin Moukandjo replaces Romain Philippoteaux. Foul by Didier Ndong (Lorient).